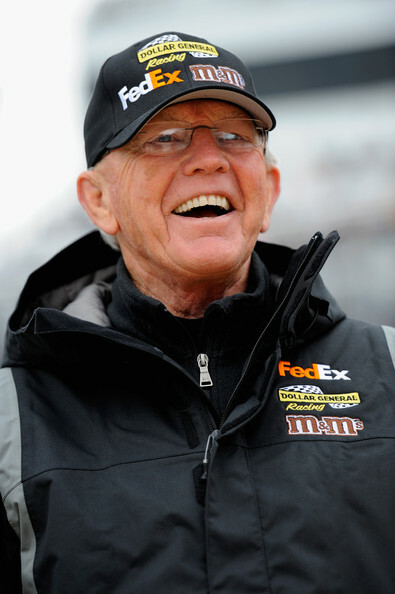 At 75-years of age, Joe Gibbs has lived a tremendous life. For 17 years Gibbs learned the ins and outs of football under legendary coaches such as Frank Broyles, John McKay, and Don Coryell. Gibbs would finally get his crack at being a head coach in 1981 with the Washington Redskins. And as a head coach in the National Football League, Gibbs led the Washington Redskins to their only three Super Bowl Championships in franchise history. Gibbs shocked the football world when he retired after 12 successful seasons with the Redskins as he wanted to spend more time with his family. In 1991, Gibbs would embark on a career in NASCAR as a team owner which would give him that opportunity. It didn’t take Gibbs that long to have similar success in NASCAR like he enjoyed in the NFL as his first full-time driver in Dale Jarrett won the Daytona 500 in 1993. By 2000, Joe Gibbs Racing was no fluke as he won his first Winston Cup Title with driver Bobby Labonte. Overall Gibbs has won six Winston/Sprint Cup Championships with the reigning champ in Kyle Busch driving under his banner. And as the NASCAR season is set to begin, Busch, along with Gibbs’ other drivers in Denny Hamlin, Matt Kenseth, and Carl Edwards will all be in the running to win the Sprint Cup Title as it all can be attributed to the leadership of Gibbs. The art of coaching begins with leadership and the ability to motivate a group of people while implementing a successful system which is something that Gibbs has done every step of the way. From 1973-1977, Gibbs was the running backs coach for the St. Louis Cardinals and there he worked under Coryell who had an offense that revolutionized professional football. Gibbs would be Coryell’s offensive coordinator from 1979-1980 with the San Diego Chargers which would be the foundation for what he did with the Redskins. From 1981-1992, Gibbs only had one losing season and he won his three Super Bowl Titles during his tenure with three different starting quarterbacks which gives you an idea of how strong that his system is. And even when Gibbs returned to the Redskins in 2004, he led them to a pair of postseason berths in four years. In NASCAR, drivers such as Jarrett and Tony Stewart have moved on from Joe Gibbs Racing, but his team remains strong. Gibbs is a man of God and he stands firmly with his faith. And although that the Redskins had their problems like any team, Gibbs always knew how to get the most out of his team as the Redskins won four road playoff games during his tenure which is no easy task in the National Football League. Now in NASCAR, after every victorious race by one of Gibbs’ drivers, there is always a team prayer on pit row with the pit crew which he leads. Gibbs is more than just a Hall of Fame head coach or a team owner as it is truly about family with him which is a big reason why he is able to get the most out the people that work for him. Gibbs has also been known to go to prisons throughout the United States to spread the word of God while he has written a trio of motivational books. And once you add all of that up, it is no wonder as to why Gibbs has had the success that he still enjoys. As the Daytona 500 is almost upon us, one of Gibbs’ drivers in Kenseth will be on the first row to start the race and once qualifying is finished for the Great American Race, something tells me that JGR will have a big hand in the outcome of who will be victorious.